Von Miller Gets A New Deal! 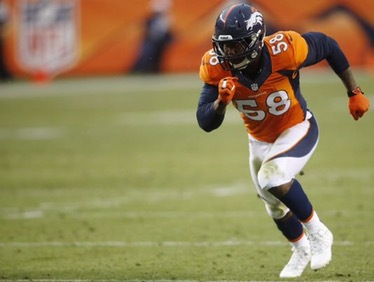 Today, the Denver Broncos and Von Miller finally agreed to a deal to keep the All-Pro player in Denver for the next six years, but it will cost them a lot, as the outside linebacker reportedly will receive $114.5 mil with $70 mil being fully guaranteed, according to Rand Getlin. In addition, Miller has been waiting for this deal for a long time. His on the field production led him here. He has recorded many awards, 60 sacks, 16 forced fumbles and the grandest prize of them all, a Super Bowl ring. Now, this past season he started all 16 regular season games. In those 16 games, he picked up 11 sacks, 35 tackles, and four forced fumbles. Finally, it is great for Miller to finally get paid, but this type of deal cripples franchises that does not allow them to extend other players, which makes the team go in a rebuild mode in a couple of years. Next Post What Are The Jets Quarterback Options?